If you’ve tried my Chocolate Banana Green Smoothie, you likely saw an ingredient in it that might not be familiar to you. Raw cacao nibs! I absolutely LOVE to use these in various recipes, as you get all the benefits of dark chocolate in its purest form. I am pretty sure that after this post you’ll be headed to the store to stock up. 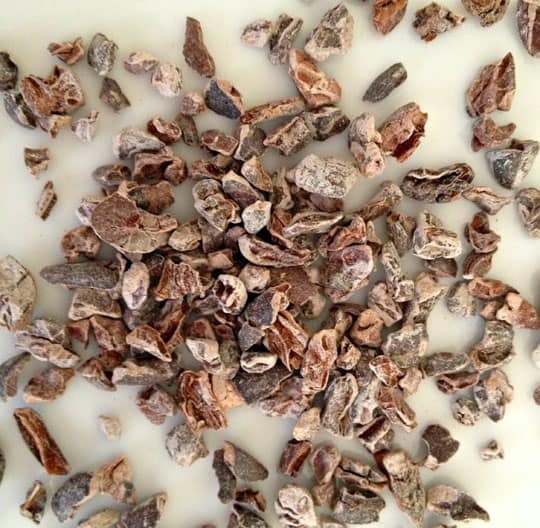 Cacao nibs are made from crushed Theombroma cacao beans. They are basically an unsweetened, unprocessed chocolate chip. There are raw or roasted, depending on the brand. The type I’m talking about is cacao, not to be confused with the more processed cocoa. Cacao actually means “Food of the Gods,” and was even used as a currency in ancient Mexican times. They certainly had it figured out back then, because cacao nibs are packed with nutritional benefits! Cacao is one of the foods that is highest in antioxidants. I’ve mentioned the health benefits of antioxidants a lot, however they’re especially important for neutralizing the free radicals in the body that are accumulated from such things as fried foods and stress. They keep you looking young, and help with heart disease, by reducing the bad cholesterol, LDL. Cacao has small amounts of something in it called phenethylamine, a neurotransmitter that can help improve mood. There is still not a lot of research on this one, but I can say I feel good after a bit of cacao. As the cacao nibs do come from the cacao bean (same place as coffee), you’re probably wondering if they have the same stimulant effect. From personal experience, I can say that those who are sensitive to caffeine may not want to have cacao nibs (or any chocolate for that matter) in the evening as they will keep you up. However, when you look at the quantities, 50g of cacao will yield about 10-60mg of caffeine, vs 5oz of coffee that will yield upwards of 180mg.